Anders Thomson won the European Under 21 Championship. Panthers supremo Ged Rathbone admits the club must carefully plot their planned play-off assault. The city team are assured of a place in the Premier League top-six with three meetings still remaining. Storming into second place and securing a passage straight into the play-off semi-finals remains the goal, but Panthers could finish anywhere between second and sixth in the standings depending on their own results and those achieved by Somerset, Glasgow and Plymouth during the final days of the regular season. They host current second-placed side Somerset in a rare Saturday fixture at the East of England Showground (7pm) after the two sides’ scheduled clash on Bank Holiday Monday was postponed. Rathbone said: “We’ve said all along that we want to finish in the top two and that will be our target until it is mathematically impossible. “But, if that doesn’t happen, we have got to be very clever about ensuring we face the right team in the play-offs. “We obviously go into every meeting with the intention of winning, but we need to be aware of the bigger picture and ensure we give ourselves the best possible chance of winning the title. “The situation will become a lot clearer on Saturday when we face Somerset and Glasgow are also in action. “It is probably our biggest meeting of the season so far and one we simply have to win. “Our weekend meetings have been well-attended throughout the season and hopefully that will be the case again on Saturday. The Bank Holiday Monday postponement delayed the debut of latest signing Anders Thomsen, who will now launch his Panthers career on Saturday night. 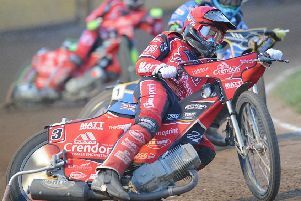 Thomsen warmed up for his arrival at Alwalton by scooping major international success last weekend with a triumph in the European Under 21 Championship final in his native Denmark. Panthers then hit the road to Rye House on Monday for a re-arranged clash against the Rockets. The trip to Hertfordshire (7.30pm) will provide a reunion with the recently-axed Robert Lambert. The Great Britain international has since joined the Rockets for the remainder of the season and is pencilled in to make his debut against Panthers. Panthers’ final meeting of the regular season is against Scunthorpe on Sunday, September 13. The start-time has been brought forward to 3pm to avoid a clash with a Phantoms ice hockey fixture.